Its never too late to achieve a bright, beautiful smile. Restorative dentistry involves the diagnosis of decayed, chipped, fractured, discolored and missing teeth with the transformative option to restore both function and appearance. At Summit Family Dentistry, we work with tooth-colored restorations or fillings, to restore decayed, missing, or fractured tooth structure. The restorations are made of composite resin and bond to tooth structure reducing stress on teeth, while creating an esthetic pleasing result! 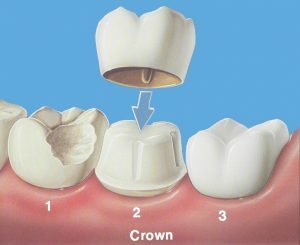 Crowns are covers or “caps” placed on a tooth or implant to restore it to its natural size, shape, and function. 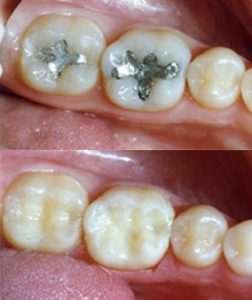 Crowns are used to replace large amounts of missing or weakened tooth structure, prevent further cracking of teeth with fracture lines, cover discolored teeth, restore a bite, or stabilize a tooth that has had root canal therapy. 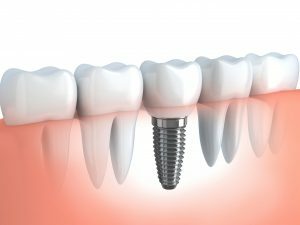 A dental implant is an “artificial root” upon which a tooth can be placed. Implants are used to support the replacement of a single tooth, multiple teeth, or larger prostheses such as dentures depending on the individual’s requirements and condition. Placement of the implant stabilizes bone levels resulting in greater long-term support, function, and esthetics. Learn more on the Implants page. A bridge is an alternative to a dental implant to replace a missing tooth. 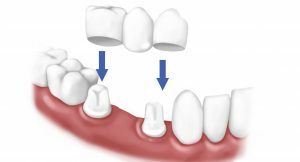 Bridge are a series of dental crowns joined together to prevent tilting and drifting of surrounding teeth that can lead to changes in your bite with potential pain. Partials and Dentures are removable appliances designed to replace missing teeth. Partials are used to replace several missing teeth, while dentures are used to replace an entire arch of teeth. They are made of acrylic, a metal base with acrylic on top, or flexible material. Each prosthesis is made to custom fit your mouth, and typically require a series of “fitting” appointments to ensure they feel and look perfect. It is also recommended, particularly for a lower denture replacing bottom teeth, to be supported by implants for increased stability in achieving the best functionality! To see if restorative dental work is right for you, get in touch with us today.